Water is a colorless and odorless liquid made up of molecules containing two atoms of hydrogen and one atom of oxygen . Water is essential for all life to exist, as it makes up more than 70 percent of most living things. While a human can survive more than a week without food, a person will die within a few days without water. Water also helps the body maintain a constant temperature by acting as a thermostat. When a person is too hot, whether from being in a hot environment or from intense physical activity, the body sweats. When sweat evaporates, it lowers the body temperature and restores homeostasis . 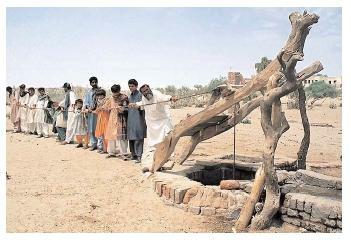 Pakistani villagers pull water from a deep well. Overpumping of groundwater has depleted the water resources of Pakistan and many other nations around the world. obese individuals are only about 36 percent water. In addition, the older one gets, the less water is retained in one's cells. As a result, old skin looks drier and wrinkles appear. Water balance refers to the balance between the amount of water consumed and the amount of water excreted. The body's water content needs to be constant for optimal functioning. Cells are bathed in interstitial fluids (fluids from between cells) that contain nutrients. These fluids also carry metabolic wastes away from the cells. Intracellular fluids facilitate chemical reactions inside the cells, and they help maintain cell structure by adhering to the cell's larger molecules, such as proteins and glycogen . Body fluids contain solutes (chemical compounds that are soluble in water), which separate into charged particles, or ions, when dissolved in water. Intracellular fluids are high in potassium and phosphate ions, while interstitial fluids are high in sodium and chloride ions. These ions help to maintain the amount of fluids both within and outside the cells. Water molecules follow the solutes moving across cell membranes from a lower to higher solute concentration to maintain homeostasis. Water facilitates a number of critical body functions, from lubricating joints to carrying away cellular waste. Physical activity speeds fluid loss via perspiration. Athletes who do not drink enough water can easily become dehydrated, which can impair physical and mental functioning. 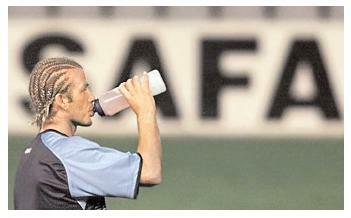 Here, soccer star David Beckham drinks from a water bottle during a practice session. When the body has lost a lot of water, the concentration of solutes in the blood becomes too high. The solutes attract water from the salivary glands, making the mouth dry and causing a person to feel thirsty. The sense of thirst is a craving for water or other fluids. When water loss is slow, a person may have time to feel thirsty enough to replenish the water loss. In cases where the water loss is excessive and acute , however, and replenishment is not adequate, a state of dehydration can occur. Dehydration is a state in which the body has lost so much water that normal physiologic functions cannot take place, resulting in symptoms such as fainting and nausea . Heat, intense physical activity (profuse sweating), diarrhea, vomiting, and excessive urination can all cause excessive fluid loss. A runner can sweat off six cups of fluid in an hour. Mild dehydration occurs with a loss of 5 percent or less of a person's bodily fluids, moderate dehydration is a loss of 5 to 10 percent of a person's bodily fluids, and severe dehydration is a loss of 10 to 15 percent of fluids. Severe dehydration can cause death. Some clinical signs of dehydration include dry skin, less frequent urination, fatigue , light-headedness, dark-colored urine, dry mouth, and lack of skin elasticity. Often, increased fluid intake and replacement of lost electrolytes are sufficient oral rehydration therapy for mild dehydration. However, the cause of dehydration has to be addressed for further improvement. In cases of severe dehydration, it may be necessary to hospitalize the person and restore fluid balance through intravenous fluid replacement. The brain and kidneys regulate the amount of water excreted by the body. When the blood volume is low, the concentration of solutes in the blood is high. The brain responds to this situation by stimulating the pituitary gland to release an antidiuretic hormone (ADH), which signals the kidneys to reabsorb and recirculate water. When the individual needs more water, the kidneys will excrete less and even reabsorb some. When excessive fluid loss occurs, the blood volume will fall, as will blood pressure . The kidneys respond by secreting an enzyme called rennin. Rennin activates the blood protein angiotensinogen to convert to angiotensin, which causes the blood vessels to constrict and blood pressure to rise. Angiotensin also activates the adrenal glands to release a hormone called aldosterone. Aldosterone causes the kidneys to retain sodium and water. When the body needs water, less is excreted and more is retained. Water intoxication occurs when there is too much fluid in the body. Excess fluid may collect in bodily tissue, particularly in the feet and legs, a condition called edema . Excess consumption of fluids, as well as kidney disorders that reduce urine output, may contribute to water intoxication. The symptoms of water intoxication are confusion, convulsions, and, in extreme cases, death. SEE ALSO Dehydration ; Diarrhea ; Nutrients ; Oral Rehydration Therapy . Whitney, Eleanor N., and Rolfes, Sharon R. (2002). Understanding Nutriton, 9th edition. Belmont, CA: Wadsworth/Thomson Learning. Shils Maurice, E., and Young, Vernon R. (1988). Modern Nutrition in Health and Disease, 7th edition. Philadelphia, PA: Lea and Febinger. how much water do you have to lose to become dehydrated?